It&apos;s been seven months since the tree-killing emerald ash borer was discovered near the Village of Newburg in southeastern Wisconsin. DATCP pest specialist Mick Skwarok says a survey of the area has determined the insect has already established a strong presence there, having already existed in the region for as many as five years. The beetle has been found in several hundred trees in an eight square mile area. Officials estimate there could be up to 50,000 ash trees in the infested region, making their removal far too difficult. 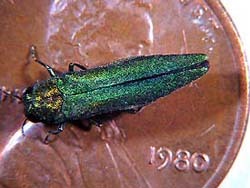 Skwarok says they&apos;re calling on area residents to help slow down the spread of the beetle by removing ash trees they think may be infested and following strict quarantine guidelines that will keep wood from being moved out of the area. The area along the Ozaukee and Washington County line is the only known infestation in the state. However, Skwarok expects others to show up soon, now that people know about the presence of EAB in Wisconsin. The state is asking residents to report any trees they suspect may be infested.